The Carrie label started in Detroit, MI (early 1960’s) but the company moved to Nashville, TN in the mid 1960’s. The label was in operation until c. 1990. James Hendrix was the label owner. The Carrie catalogue featured both gospel and secular releases. There may be several issues missing in the discography and the given years could be inaccurate. The 45’s by the Corder Family (Carrie 382 and 396, the latter was prob. released in 1970-71 and omitted from the discography) were also on Kent LP 569. Both sides of Carrie 393 (Rev. Amos Jones Jr.) were also on the Rev. Jones LP “I Know The Man” (Carrie LP 2271), released in the early 1970’s. 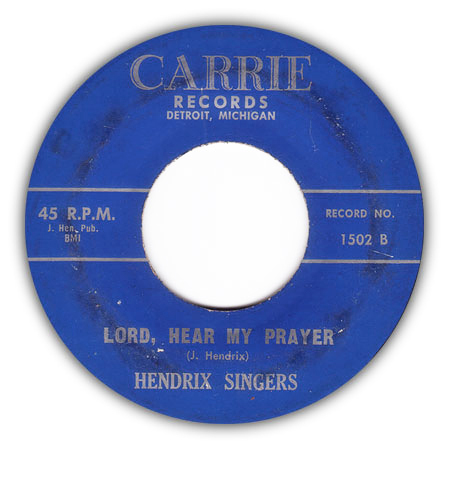 This page lists all known Carrie gospel releases (singles and one EP) from the 1960’s. Later releases have been omitted.